Wisconsin is an undiscovered jewel for hikers of all skill levels. The vast wilderness combined with the effects of glaciation during the last Ice Age have left some beautiful landforms. This article will cover just a few of the best hiking trails found here. We will highlight a few notable trails of different skill levels spread around the state. This small selection is just an introduction to the weeks or months you could spend in the natural beauty of our wild north. The Ice Age Trail is a 1200+ mile long trail that stretches across Wisconsin. Much of the Ice Age trail is stunning. The trail is broken down into sections and many are among the most hiked in Wisconsin, some of those sections will appear on this list. The Lapham Peak segment of the Ice Age trail is about 8 miles long and considered easy to moderate in difficulty (in good weather it can lean toward the easy side). It gains just 400 feet, much of it spread across the back mile of the trail. Some hikers struggle to get up that last stretch but the view from the top is well worth it! Crowned with an observation tower, Lapham Peak provides unparalleled views of the Kettle Moraine State Forest. From the top of the tower, you will see a vista that stretches for miles. The rolling, forested hills are best viewed to the west at sunset. On your way from the trailhead to the peak, you’ll wind through a large variety of ecosystems. At the lower ends of the trail, you are greeted with grasslands, wetlands, and large meadows that are full of flowers in the spring. As you move on, you will progress through both a hardwood and coniferous forest. There are a number of trees with amazing character that have been twisted by the valley winds, while others are straight as an arrow, soaring high above the trail. Most of Lapham Peak’s trails are very well maintained and groomed with walkways and stairs. A few sections are a little wilder. Both have their own charm, but in rainy weather the unmanicured sections can be a little slick. Along the trail, you will be introduced to the history of the area, from its shaping in prehistory to its use as a weather observation station in the late 19th century. The peak of the trail has a well-maintained tower that will put you far above the treetops. Most people can complete this trail in just a few hours. Time permitting, this leaves you with the option to explore one of the other amazing trails around the Lapham Peak Unit of the Kettle Moraine State Forest. These trail loops overlap and connect with the Ice Age trail. There are over 17 miles of trail in the Lapham Peak area, about which you can read more here: Lapham Peak Trails. You can also venture a bit southwest to find the Southern Unit of the Kettle Moraine Forest, where there are hundreds of miles of recreational hiking if you have the time to spend. The signature trail of Potawatomi State Park, this loop stretches just over 5 miles around the majority of the park’s perimeter. Rated as a moderate walk, this trail gains just under 300 feet of elevation, most of it around the two-mile mark. The initial jump in elevation can be rough but the slow uphill gain to the peak afterward is a fairly easy walk. The reward at the top of this stone mountain is well worth any hike to get there. The view north across Sturgeon Bay and on to Lake Michigan is among the best you can get! In the summer, activity on the trail is moderate but activity on the lake is heavy. The view from the top is breathtaking, with ant-sized boats skittering across the lake and around the island and bays. As fall approaches there are ample viewing locations for the changing foliage that spreads for miles to the north and east. Generally, this trail is less hiked in the winter due to the cutting lakeside winds. However, those last few months leading up to November are well worth the hike. Spring is rife with wildflowers and abundant wildlife in the area. Deer are commonly spotted along the trail and show little fear of approaching people. The hemlock forests are full of the chattering of many bird species and squirrel. Among the best parts of this trail are those that run right along the banks of Sturgeon Bay. Here you will find rock cliffs and stone-strewn beaches in abundance. There are several places where you can rest your feet in the cool waters and rejuvenate. This is a well-maintained trail but keeps with the natural surroundings. You won’t find any boardwalks or stairs other than a few chiseled into some rocks. If you are looking to get back to nature, this is a great trail that is easy enough to walk for most people. The highest point on the trail is topped with an observation deck but that has been closed for the time being. Whether or not it will reopen any time soon is dependent on funding but for the next couple of years, that doesn’t appear likely. Luckily, the view is still amazing without the tower. Once you have walked the Potawatomi Loop, you have seen most of the notable features within the park. There are several other trails that make up a part of the Ice Age Trail and do have some rock features. Instead of hiking those trails, you could always skip about 20 minutes north and check out the trails of Whitefish Dunes State Park and Old Baldy. Within an hour north, there are three other state parks with great trails and great views if you are still in a hiking mood. If you are done walking, a short drive south will put you in Algoma where Skaliwags serves some of the best steak and seafood you have ever had. Located in Perrot State Park along the Northern Mississippi River, the Riverview delivers just what it says. With expansive views of the river and its multitude of wetland islands, this is one of the best trails along the river in all of Wisconsin. Considered a hard trail by most, the elevation change is about 750 feet stretched across 3.3 miles. Most of the elevation change occurs getting up to Brady’s Bluff but it does provide the best view of the half-mile-wide Mississippi River. For the more fit, the walk is worth the result and occurs right at the culmination of the trail. The Riverview Trail is best reserved for drier weather. The lower sections become soft and sometimes even flood in heavy rains. Even in dry weather some of the wetlands come all the way up to the trail. Rain can also wash out some sections of trail leaving exposed rocks that need to be navigated with caution. That said, when the trails are flooded, alternate routes up to the bluff can provide you with some amazing waterside views. The trail itself is fairly well maintained but not up to par with some of the other state park trails. As it is, the wild nature of the trail does provide some charm but can be rough walking at times. The lower sections of the trail are better maintained. They provide you with a great habitat to view the many waterfowl and herons that call this area home. Some of the wetlands will be full of vibrant birds during migration and mating seasons. At the top of the hill, a stone and log shelter provides a place for a well-deserved rest. It offers amazing views west of the river and of Minnesota woodlands. This is a great place for sitting out of the sun and just taking time to be in the outdoors. The trailhead starts just outside an amply sized campground if you choose to spend the night. The trail is unlikely to take more than a few hours to hike but there are several other trails within the park worth exploring. The Riverview is by far the most enjoyable but only makes up about half the available trails. If you are willing to make your way down to Onalaska, Hixon Forest has some great trails. 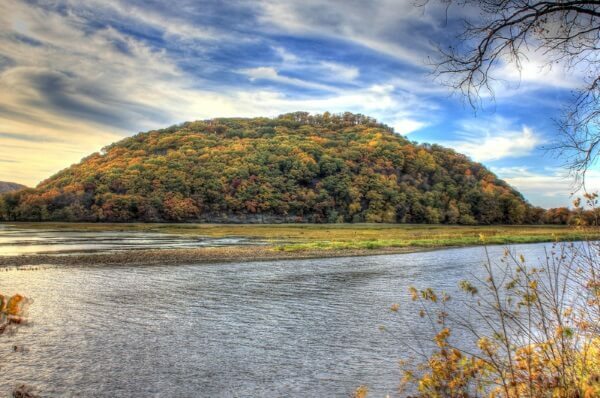 Or you can make your way back up the Minnesota side to Great River Bluffs State Park. This gives you a view from the other side of the river and the amazing island formations of Lake Onalaska. Read about more trails at Perrot State Park. Not too far north from Potawatomi State Park lies Peninsula State Park, home of Eagle Trail. Don’t let the distance of this 2-mile hike fool you. Your time on this trail will be well worth any effort this trail takes. Most trails are popular for their long distance views and this trail has those. But the views, as impressive as they are, are not the reason to walk this trail. What the Ice Age did to this area is evident in the amazing rock formations that dot the trail, including caves and arches galore. It is impossible to walk below the towering, worn cliff faces and not see the power of those glaciers in a new light. The start of the trail is well-groomed and will take you through a sparse coniferous woodland. This culminates in a view east across Nicolet Bay. This easy section of the hike is relaxing in preparation for the drastic change as you drop down the ridge to the lakeshore. As you make your way up the rocky beaches, the cliffs above are the real reason to walk this trail. Numerous small slips and caves are explorable for the brave. For the rest, there are the stepped faces of the cliffs themselves to draw the eye. Most people stop hiking this trail in October due to the frigid winds but a winter hike here shows an alien landscape if you are willing to put in the effort. Summer is still the best time for hiking but all seasons can be quite impressive. This trail may take you about an hour. When you finish, there are dozens of other amazing trails strewn around Peninsula State Park. You could spend a week here and not see them all. The Sunset Trail is highly recommended for a great evening walk. The Lone Pine Trail is another great option. If you still haven’t had your fill, nearby Newport State Park has good trails to offer. Or, you could make your way back down south and hit the Potawatomi Trail mentioned above on this list. In truth, the Peninsula area of Wisconsin has a lot of great trails and even better food! Well worth the trip! Find more information about Peninsula State Park Trails. Whether I saved the best for last is really a matter of opinion. It could be that I saved the hardest for last. Whatever the order, the Loop at Devil’s Lake Oak Forest State Nature Area is one of the most impressive hikes in Southern Wisconsin. Though it is often rated as moderate, some sections of this nearly 5-mile long loop can be downright brutal. The elevation change is right on the cusp of 1000 feet. The majority of that gain comes in two steep pushes that can wear down the fittest hikers. This is a trail best walked slow. This is simply the most stunning trail that I have found in the state. From its lowest reaches through the creek valleys to the stone topped peaks, every foot of trail is an amazing hike. Once you fight your way up to the heights, you will have an unparalleled view of the lake and pine forest from atop stunning cliff faces. In some cases, rocks balance precariously as they have stood for thousands of years. This is the best example of glacial change you can find! Most of the trails are well maintained due to the large number of hikers on some stretches of the trail. There are numerous rock climbing lanes off this trail that keep it busy in the summer months. Due to the northern climate and harsh terrain, this is a summer and fall trail. Water and ice are not your friends up here. If you don’t feel like the whole loop, you can walk just the East or West Bluff Trails independently but the greatest effect comes from the whole walk. Generally, this takes the majority of the day for most hikers. When not on the cliff faces, the trails run along the lakeshore and several beaches, one sand and a couple with stone bottoms. In the summer, this is a perfect place to cool off as you reach the middle of your hike. If you walk the western side first, you will be glad for this opportunity. When you are done with your time at Devil’s Lake, there are a number of other parks within an hour’s drive. All of these are well worth seeing though most are very short on trails. It’s best to take your time on the lake and see everything you can before moving on. 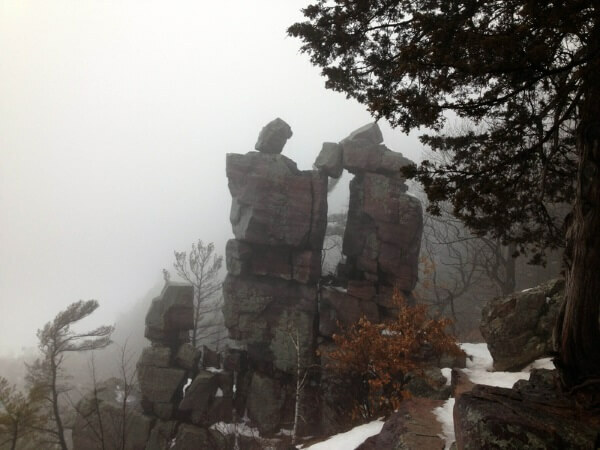 Read more about hiking at Devil’s Lake State Park. With well over a thousand designated trails stretching tens of thousands of miles, no single person can hope to walk them all. The idea behind this article is to detail a few of these trails that may be worthy of your time. The locations of the trails provide a great spectrum of those available in this great outdoor state. They also put you in proximity for dozens of other great trails. Consider this article a jumping off point for your exploration of the wilds of Wisconsin and its many amazing places! The only thing that is certain is that you won’t find any of these places indoors. Its time to get out and put a few miles on the hiking boots!